The 1994 family comedy Blank Check teaches us a valuable lesson about money and the tendency to underestimate what a modern lifestyle really costs. Acclaimed actor Brian Bosnall plays Preston Waters, your typical self-important tween who is frustrated with his lack of status in the world. Through a series of impossible coincidences and comedic mistakes by some bumbling white-collar criminals (including Tone Loc’s seminal portrayal of “Juice” [pictured above]), Preston becomes a victim of a minor hit-and-run and is suddenly in possession of some hush money in the form of a blank check. C’mon Preston, grow a pair. 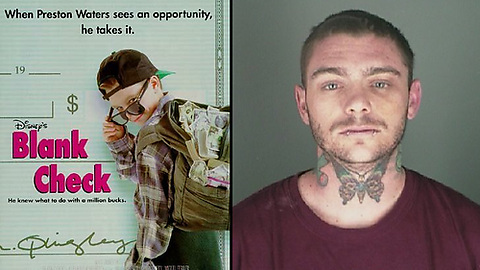 Of course, Blank Check came out in 1994, which was before the Patriot Act and all of those bureaucratic Know-Your-Client restrictions. So of course, Preston has no trouble proceeding to cash the check. He quickly developed lavish tastes, hollow friendships, and romantic interests in 20-something bank tellers. Preston’s parents also display some of the most absent parenting that you’ll ever see on the silver screen. Needless to say, Preston goes full Rihanna and his million-dollar adventure only lasts six days before the money is gone and Preston is left with little more than a cynical view of adulthood and some oversized Sumo costumes. Real-life actor Brian Bosnall seemed to have taken away a similar lesson, as evidenced through this mug shot some years later. While the Mustache and others might be weaving multi-year webs of lies, I choose to believe that these retirement stories are true and that breakin’ the chains of employment with such meager sums is totally doable. So, am I crazy to have a stated net worth goal of just $1 Million to retire? Well, let’s see. Let’s see if a $1M net worth, allocated as above, is enough to retire. First, I don’t want to speak about me, specifically. My personal life situation (i.e. single, no kids, living in tent, stealing brown rice from Trader Joes), might not translate to your average Joe. So, rather than speak about me for a minute, let’s discuss if $1M is enough for the average family in America. From here on out, we’re going to be talking about Joe, a 40-year-old resident of Anytown, USA working at Median Household Income, LLP. Joe has 2.58 members in his family, and they aren’t stupid. Joe has a $1 Million net worth, and he wants to know if it will be enough to retire. First, we have to talk about how that $1M is comprised. Joe doesn’t want to enter retirement with any debt, and he values security, so Joe owns his home, worth $250,000, outright. That’s slightly higher than the U.S. median existing home value ($232,200). 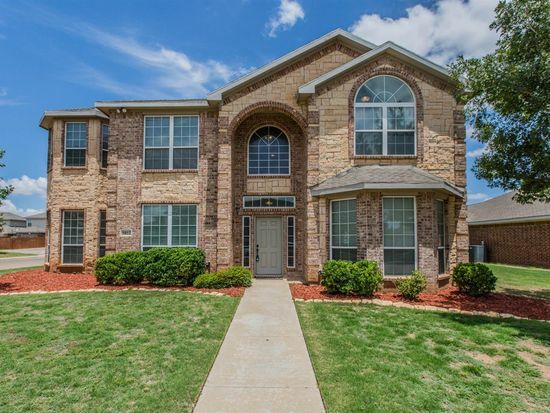 There are tons of great houses available for decent prices if you are flexible about your location and are independent from a workplace. Joe and his family take advantage of this. After his home value is removed from his net worth, Joe is left with $750,000 in investments, which is smartly distributed with one-fifth in non-retirement accounts. A 4% safe withdrawal rate of that $750k provides Joe with $30,000 a year in income. So, the real question is: can Joe’s average family sustain a typical lifestyle on $30k per year. Thankfully, the Bureau of Labor Statistics already does a consumer expediture survey, which provides data on such things like the average expenses of a normal family. 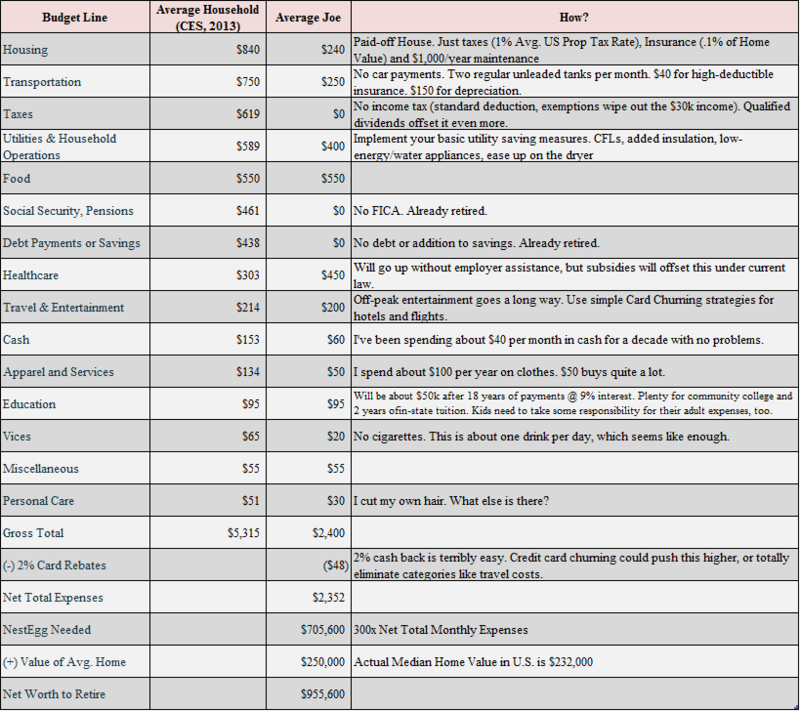 I’ve copied that below, but also did something reasonable—I adjusted the average expenses in certain areas to reflect the realities of a retiree (e.g. no FICA, no income tax, no savings contributions) as well as adjusted some items to reflect a somewhat frugal lifestyle (e.g. lower personal care, debt payments, apparel, and transportation). Now, before you kill me on the suggested changes, think about it. Think about the life of a frugal retiree and how realistically some of these changes could be implemented. $1,000 a year in home maintenance might not seem like much, but it goes a lot farther when you provide your own labor since you aren’t working. For transportation…no commute, high deductibles, and cheaper cars can really put a dent in those expenses. I see this budget as altogether reasonable, although Joe’s family would certainly need to be deliberate about their spending. And, anecdotally, I’ve found that this level of expenses is also reasonable for my own family (Read this post). That post details my expenses now, and how those expenses may change (up/down) during retirement. I found that at the point I’d be ready and comfortable to retire, my expenses would be $1,960 per month, requiring a portfolio of $588k at a 4% withdrawal rate—much less than Joe’s $750k. After throwing that article to the wolves (see: Retire29 readers), I upped my numbers to $2,150 in expenses requiring $645k in investments. So, even my peer-reviewed, based-on-real-life expenses could be achieved with $750k of investments. 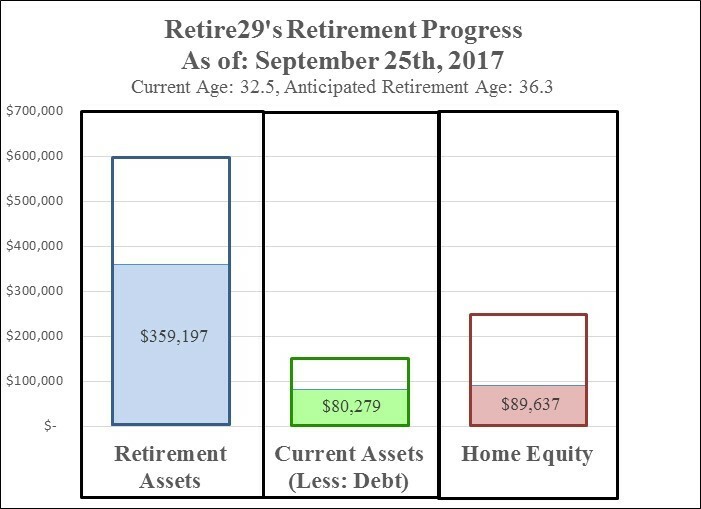 Thus far, we’ve described the realistic potential for somebody to retire on $750k of investments generating $30k of yearly withdrawals. I think we’d all agree that this is possible for the average person, but given certain luxuries or budget customization, $30k is probably not desired for most. But, here’s the rub. $100 here or $200 there in monthly expenses is a pretty ludicrous distinction. The only takeaway we should be making from the “nestegg” conversation is that $1M is adequate for a comfortable, average American family existence. It affords few luxuries and certainly won’t provide much psychological comfort against the financial contingencies of life. For instance, how will I pay for Toddler29’s top-notch criminal defense team when the need arises? Thankfully, for nearly every retiree and particularly early retirees, the exact nestegg balance is of little importance thanks to the fact that retirees still have income. A retirement without income is like the famous “frictionless plane” we learned about in physics class: it doesn’t exist. Every retiree that I know (both normal and early retirees) has an income—a pension, a side job, a blog, social security, a rental property, or selling stolen Trader Joe’s rice or other household goods. Find me one retiree that doesn’t have some form of income and I’ll send them $1 per month just to make you wrong. 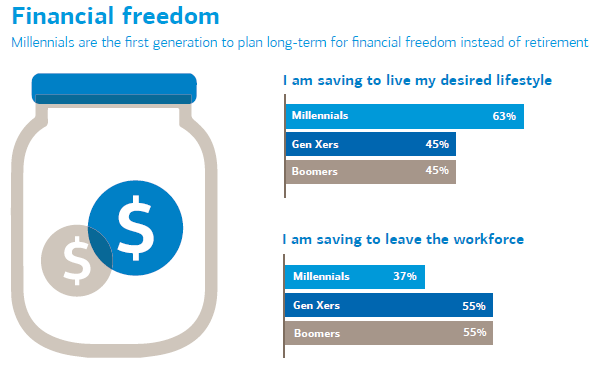 Younger generations may never experience a traditional retirement. While most of today’s retirees (83 percent) are not currently working or never have during their golden years, the majority (83 percent) of millennials plan to work in retirement whether for income, to keep busy or to pursue a passion. Can you all relate to this mindset? I sure can. I’ll always make money. I like writing. I like doing taxes. I like selling stuff. Hell, I even have a Adsense-enabled YouTube channel where I post random videos of my kids (that thing somehow brings in like $3 per month). I’ll never stop doing those things—and they make money. Granted, it’s not a lot of money (I reckon around $200 per month in aggregate), but in retirement, any income at all goes a long way. Of course, something could go drastically wrong and I would be forced back into the active workforce that I left long ago. If that occurs, okay, I’m no worse for wear—I’ll have a good story. If it doesn’t, even better. Given that I plan to continue paying my insurance premiums and that I’m using the 18-year-runway to prepare for my kid’s college, I think the likely outcome is that most major expenses will be overcome by simply taking a relatively small withdrawal from a large pool of invested, dividend-producing assets. So, Uh, Is $1M Enough or Not? If I woke up tomorrow and my net worth was $1M, I’d put in my resignation for early next year (may as well get the annual bonus). I’d feel confident in my ability to leave salaried work and start my next life. That sense of confidence is predicated on the fact that those $1M of assets are sufficient to provide for my baseline lifestyle, as well as the knowledge that I can make income for myself at a leisurely-but-effective pace even while retired should I need or want more. I, perhaps foolishly, believe that most people think a lot like me. I think anyone looking to retire needs to go through this analysis. There’s no way you can make that decision based on someone else’s analysis… but then again, if you are the type to consider FIRE, you probably already are. Another side benefit – you start thinking about things you should be thinking about anyway! Nobody, and I mean nobody, would make such a huge decision based on one article one the internet. This is meant to dispute the all-too-common notion that $1M is not enough. This looks like a good viral article candidate. Hopefully it will see a lot of eyes because it is well researched with a lot of basis. Thanks for sharing. I also just noticed that you snuck some TTD in your portfolio. I thought I was the only one who knew about that little gem. I’m up 30% in 3 months. Hopefully maintains solid growth for years to come. I think the big unknown is health care. The insurance hack that allows high net worth early retirees to get subsidized healthcare while high earning side gigging early retirees like me pay full cost is not going to continue forever in my opinion. I feel like they will apply an asset test of some kind to prevent relatively wealthy people from getting a free ride. Couldn’t agree more. I’ve done the math and if the Obamacare subsidies went away (or effectively went away for me due to asset-based pricing) I would have to work for another 12-18 months to save enough to make up the additional monthly cost. Thankfully, inertia is the most powerful force in government, and it would seem those subsidies aren’t going anywhere soon. It really is person and situation specific. If you had five kids and lived in New York City where you refused to move away from family your million scenario is unrealistic. If you lived in the Midwest away from people it might support your life vary well, especially without kids. Each persons situation is different. Well, obviously. That’s why I used “Average” Joe and not “Five Kids in Manhattan” Joe. The latter article would be completely unrelatable. I could conversely say that $1M is an outrageously excessive amount to retire for, say, a single person living in Delhi. Good article! The numbers are a little different here in Australia, but I think it is invaluable to take the time to determine what an individual needs to retire early. My number fluctuates, but that’s largely because I’m nowhere near the finish line, and I enjoy tweaking everything. But a million dollars would do it just fine. It really depends on where you live. There are many places in the US and abroad that you can retire on $1 million. It’d be tough for us in Portland, though. The taxes are high and it’s getting expensive to live here. We’ll have to move to make $1 million. Even then, I think it’d be a close call especially if you’re young. Yep, this is an average person with an average budget making some commonsense changes to that budget based on a retired lifestyle. It totally makes sense that individual situations would require less or more than $1M. The 4% rule still reigns supreme. Some solid planning on your part. I just came across your website and enjoy it. I share a similar active thinking towards early retirement that you express on the site. I am also a veteran (Marine) 38 years old that went back to school and received an M.B.A. (thanks to the government flipping the bill “G.I. bill”) , as I am sure you took advantage of as well. I did actually have to come out of pocket about 10k once I used up the full benefit, but figured it was worth it to finish and say I accomplished a masters degree. Although, this degree has not helped me out to land an actual job, lol. I don’t regret it, I enjoyed the classroom time with like-minded educated students to share business ideas with and be forced to research business theory and practice via teachers and required assignments. Anyways, I have been frugal most of my life, but more importantly only recently started thinking about early retirement and living below my means to prepare for a nice little nest egg to retire early (my goal is 45-50), I started late at 28. I read a few books and did some extensive research on being able to retire early and it really is not that hard, and you don’t need to make 100k+ a year to do so. All it takes is some discipline and saving, but most importantly spending less then you earn, and putting away the excess in wealth building or interest bearing investments. “Letting your money work for you instead of working for the money”. I document all my spending, and if at the end of the month I am nearing the 5% I simply dont go out to eat. Sometimes, there is excess and I just add that to next month. I think people just need to be a little more organized and conscious of there spending and the can have financial freedom at an early age. Anyway, I’m rambling, nice website and good solid advice and content. Even after reading this I strongly think that the retirement amount is subjective. Of course, a million dollars is a huge amount but it won’t be enough if a person has some debt to clear and a larger family to take care of. Also, how and where that money is invested also matters a LOT.